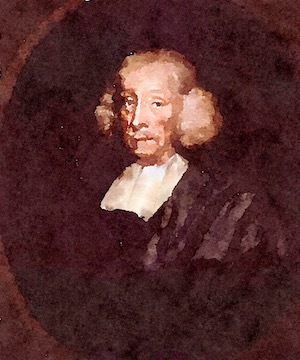 Although he was the son of an Essex blacksmith, English naturalist and theologian John Ray (formerly Wray, changing the spelling in 1670 to facilitate Latinising, 1627-1705) was educated at a local grammar school, went on to Cambridge in 1644. He went on to become a fellow of Trinity College, lecturing in Greek, mathematics and the humanities. Already familiar with existing botanical literature in English, Ray was struck by the absence of anyone familiar with the subject at Cambridge. As a result, from the early 1650s, he started to compile a catalogue of all the plants he found during long walks in the countryside around Cambridge. Like his peers, Ray was accustomed to preaching in his college chapel and at Great St Mary's church and went on to take holy orders in December 1660. Two years later, he was one of over two thousand clergymen who refused to take the oath required under the Act of Uniformity 1662 and were subsequently expelled from the Church of England. The Act prescribed the form of public prayers, administration of sacraments, and other rites, according to the Book of Common Prayer, although the 1662 edition was so new that most of the clergy had never seen a copy. After he lost his post at Cambridge subsidies from his wealthy fellow naturalist, Francis Willughby allowed him to travel extensively in Europe studying botany and zoology with Willughby, Philip Skippon and Nathaniel Bacon. After parting company with Willughby, who was moving on to Spain, at Montpelier, Ray returned to England in March 1666. In the course of their travels, Ray and Willughby accumulated substantial collections of animal and vegetable material, which they intended to use to develop systematic descriptions of the animal and vegetable kingdoms. Willughby's work on the animal kingdom was unfinished when he died in 1672, leaving Ray to finish the sections on ornithology and ichthyology. Ray used the botanical collections for his Methodus plantarum nova (1682), and Historia generalis plantarum (3 vols., 1686, 1688, 1704). Catalogus plantarum Angliae (1670) described plants gathered on his British tours. All Ray's works included extensive medical and pharmacological notes along with his descriptions of plants. His classification of plants was an important step towards modern taxonomy, and he was the first biologist to give a definition of the term species. In the meantime, Ray had been elected Fellow of the Royal Society in 1667 and married Margaret Oakley of Launton in 1673. The couple initially lived at Middleton Hall Willughby's family estate near Tamworth in Warwickshire, where Ray was charged with attending to the education of Willughby's sons. After a two-year stay at Falborne (or Faulkbourne) Hall in Essex Ray moved back to his birthplace, Black Notley, where he remained, writing books and corresponding widely on scientific matters until his death at the age of seventy-seven.